“Let’s Travel with Cheap Accommodations to Tokyo!”, maybe the first time you guys see the title of this post, some of you will think is it even possible to have cheap accommodations in the most expensive city in the world, which is Tokyo? Since I don’t believe that there is something impossible in this world, then the answer is “Yes”! It is really possible to have cheap accommodations even in the most expensive city like Tokyo. Therefore, for those who are going to travel to Tokyo with limited budget or going for backpacking to Tokyo, you guys don’t have to worry since all of your needs are in this post! On the contrary with the last post, in which I covered some of the most luxurious hotels in Tokyo, in this post I’m going to cover some of the options for those who’re going to travel to Tokyo with the limited budget. Actually, there are lots of options for cheap accommodations in Tokyo, from the very cheap place to the normal cheap place. Of course you better do not expect for a luxurious place to stay, just like what I covered in the previous post, however, these place would be really cheap compared to the hotels in Tokyo. Staying at internet cafe or net cafe is one of the best answer for the limited budget travelers or backpackers. For those who are living in the Western countries maybe feel a little bit odd with a place like this, however, this kind of internet cafe has become one of the major places for the Japanese to stay, in case they miss the last train to go home or for those you don’t have any home at all. Just like what I said, some of the homeless in Japan choose to stay in this kind of internet cafe because staying in this place is really cheap. Though this staying in this kind of internet cafe is really cheap, however, don’t you ever think that this place is some kind of cranky old places. As you can see in the pictures that in Japan, each seat in the internet cafe is separated by walls, making like a small room. So you don’t have to worry about your goods while you’re asleep since it is more or less like a tiny hotel room. Moreover, for those who can’t stay far from the computer, in the Japanese internet cafe you will be able to access a high-speed internet computer in your room, something that the luxurious hotels don’t provide in their rooms. There are two types of the rooms in the internet cafe, those that use boss-like seats or message seats and the other one is the full-flat seats where you can lie down your body inside the room. Don’t forget that while staying in the internet cafe, you can also taking a bath by paying some more. One of the biggest and the greatest internet cafe in Tokyo is Bagus Gran Cyber Cafe. Bagus Grand Cyber Cafe really is an affordable and a nice place to stay since the facilities that Bagus Gran Cyber Cafe offers are the greatest in the level of internet cafe. The price in Bagus Gran Cyber Cafe is 500 yen for the first one hour and 80 yen for every additional 10 minutes, cheap isn’t it? Moreover, since Bagus Gran Cyber Cafe has lots of branches, there will be no sweat to find the Bagus Gran Cyber Cafe. Just like in Indonesian language where bagus means good, Bagus Gran Cyber Cafe is a really “bagus” place for those who look for cheap accommodations in Tokyo! Since Japan is a country which area is considered as small, it makes every metre of land in Japan become really precious. That kind of situation makes the Japanese thinks about how to make a hotel that only need small space but can accommodate lots of people and capsule hotel is the manifestation of that thought. The capsule hotel in Japan, actually, has become well-known in the global world due to the unique shape and design of the place, and not to forget the cheap price those capsule hotel offer. Staying in capsule hotel, of course, you will sleep inside a capsule-like bedroom that lines up inside the room. Though compared to an actual hotel, this “room” that you pay in the capsule hotel is so tiny but it is still more than enough to lie your body down comfortably inside it. Not to mention there are some facilities inside your capsule as well, such mini TV and radio. Staying in a capsule hotel most likely you will stay in the same room with other people, but for those who like privacy there is a curtain in each capsule, so you can still have some privacy in here. 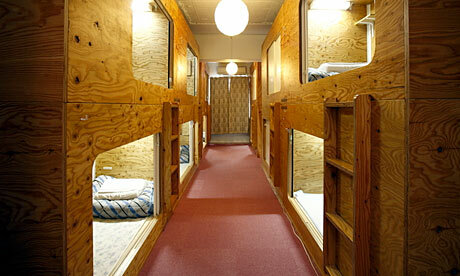 Same with the internet cafe, capsule hotel also provide a bathroom for the customers. Usually, most of the capsule hotels have provided you with some of the shower equipment too, so you really don’t need to fill your bag with a bottle of shower gel or shampoo. Some of the capsule hotels even offer better facilities than what I just mentioned above. One of the noteworthy capsule hotels in Tokyo is Shinjuku Kuyakuso-mae capsule hotel that is located in Kabuki-cho, Shinjuku. Beside its great location that is really near from Shinjuku Station (5 mins by foot), Shinjuku Kuyakuso-mae also has a sauna place, a restaurant, and wi-fi access. The price for each night in this hotel is 4.200 yen and you can also have the breakfast with additional 400 yen. Don’t fancy with those kind of accommodations I mentioned above? Don’t worry since there is still another option for those who wish to stay in a more “normal” place. Staying at hostel or guest house is the option. In Tokyo, you can find a hostel or guest house easily, especially in an area that is famous for the tourists. In a hostel or gueshouse, mostly they offer a dormitory room where there are some bunk beds located inside it, so you will have to share a room with other travelers. However, sharing the same room with the travelers from the other countries is also one of the main appeal for staying in the hostel or guest house. For those who like to socialise or make some new friends, staying in hostel or guest house would be a great choice for you. One of the noteworthy hostels for you to stay is Sakura Hostel that is located in one of the most popular areas in Tokyo, Asakusa. The price for each bed in the dormitory room is 2.940 yen, I don’t need to say that it’s really cheap anymore, do I? Moreover, for those who need more privacy, Sakura Hostel also offers a private rooms with twin bed inside, the price is 8.295 yen for each room. Another facility that Sakura Hostel has to offer is a wide lounge where you can have some conversation with the other travelers. Feeling hungry? Worry not, since there’s also a shared kitchen for those who want to cook to save some money. The reception in Sakura Hostel is open for 24 hours and the crews are also multilingual which make your trip far more easier. I guess there is no reason for me to say that Tokyo is a really expensive city. In my opinion, Tokyo is a complete city, where there is a range of prices, from the cheapest one to the most expensive one. So, for the backpackers or the limited budget travelers, there is no reason not to put Tokyo in your destinations list since you guys can still enjoy Tokyo as much as the others! Aah, I wanna stay in that capsule bedroom! !